Thirty-nine years ago I spent a Shabbos with Real Jews in Boro Park. Don’t look at me like that; that’s exactly how my Conservative Hebrew School in suburban Philadelphia advertised a program where children from non-frum homes were invited to spend Shabbos with Orthodox families in Boro Park, Brooklyn. For two years I attended those Shabbatons and remember them clearly to this day. Let us return to those wondrous years, to see what I saw, and experience the beauty and inspiration of those visits. I came from a typical middle-class Jewish American neighborhood where the parents were all doctors, lawyers, and professionals. The kids went to a Very Good public school and were all expected to become successful professionals. We lived in a lovely suburban community, in stone or brick houses with ample yards and many toys. As culturally proud Jews, we attended Hebrew School and had fancy Bar/Bat Mitzvah parties. Life was all about school and after-school and car pools. So there we were, a school bus load of suburban kids, dropped off in the middle of Boro Park one Friday afternoon in the spring. We were divided up and sent to various addresses and told to meet back at shul. My friend Shelley and I were dropped off at a door on an avenue. Our host family lived above a store—how exotic! We rang the bell and went upstairs. At the top, I saw a living room filled with bookcases, a dining room with a huge table set for Shabbos, and a smiling Mommy greeting us and assigning one of her daughters to be our guide. The apartment had two bedrooms, where the parents and the boys slept, and apparently the ten girls slept downstairs in the basement. We trooped down two flights of stairs to a simply decorated basement room which had a bathroom, ten beds, and some garment racks filled with clothes. It was very different from the spacious homes we had just left, where every child had his own room and closets were bigger than a Brooklyn apartment. At shul, I enjoyed the davening and was intrigued by the machitza. I liked the idea that shul was a place to connect with Hashem, not for socializing. We returned to our hosts for Kiddush, climbed the dark and narrow stairs and entered a room filled with light. Our gracious hosts had fourteen of their own children (k’ah) and still found room to host Shelley and me, as well as a couple of other adults from the neighborhood. The singing was angelic, the food was divine, and I could not stop asking myself if this was really happening to me. My grandmother, one of twelve children, used to describe Shabbos scenes around her parents’ table. It seemed that my Boro Park experience was a re-enactment of those memories. The next morning, I opened my eyes to see our ten-year-old hostess staring intently at me. As soon as she saw that I was awake, she commanded me to put out my hands. I complied and she had me repeat Modeh Ani after her and then deftly poured water over my hands into a large bowl. I asked her why we had to do that and she said, “When you sleep, your neshama goes up to Shamayim and it’s like you’re dead. When you wake up, your neshama comes back to your body. The death part leaves out of the tips of your fingers, so we have to wash the death stuff off.” Talk about blowing my mind! You mean there’s more to life than just what we see? What a concept! I gotta get more of this! After getting dressed, I went upstairs for breakfast. As I entered the living room, I saw the father of the family sitting in front of a Gemara. His two-year-old son was on his lap, and the two of them shuckled together as the father learned aloud. I looked at this scene and with all my heart I felt that this is how I wanted to live my life. The rest of that Shabbos with Real Jews in Boro Park was a kaleidoscope of unforgettable sights and soul-searing thoughts. When I returned home, I begged my parents to send me to Bais Yaakov, but my parents convinced me that a ten-year-old was too young to make the trip to Brooklyn every day. I stored my thoughts and dreams in a secret pocket in my heart, and when I was married, I shared them with my husband. Fifteen years after that first Shabbaton, I was living a frum life. Twenty-seven years after that first Shabbaton, I woke up one day to realize that I had achieved exactly what I had asked for: we were Chassidic, my husband learned, and our children followed in our ways. As I looked around at the sefarim-filled bookcases lining my dining room walls, and watched my children patiently explaining to our Shabbos guests how to wash al netilas yadayim, I saw in my mind’s eye that first apartment filled with light. Yentl Eisenberg is the mother of a large family living in Brooklyn, NY. Bravo! Your life is like a dream come true for you! Yentl, I love how you describe that Shabbos in Boro Park, with the ten beds in the basement. It comes alive. I enjoyed very much reading this beautifully written and meaningful essay. I wanted to be happily – or at least successfully – married (my parents are divorced). I wanted lots of happy children. 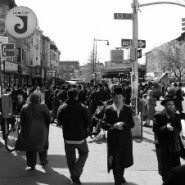 And – if it wasn’t asking too much of G-d – I wanted to live in Crown Heights. I loved Crown Heights (we lived in Massachusetts). Hashem in His kindness gave me all three of my requests. But, Hadassah, that does not mean my life is a dream come true. There are many difficulties and much pain. But when we get the main things we asked for, we say thank you, G-d. So beautiful! I cried as I reread it.